Knowing how to treat driftwood will ensure your driftwood products look their best, and that they will last for many years. 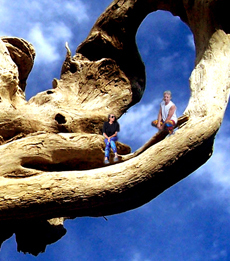 Unlike most other types of wood that you buy all ready to use, driftwood needs to be prepared before use. The first thing you will need to know about cleaning driftwood is that when you collect the driftwood pieces on the beach the pieces will be sandy and salty. The salt is on and in the driftwood, and retains moisture, which hastens wood decay. It is therefore essential to begin the driftwood treatment with a good clean. We start the driftwood treatment by brushing our driftwood pieces with a brush. The severity of the brushing may vary, from a light brush using a paint-brush, to a severe scour with a wire brush. The brushing is to remove loose wood and bark, and as much more sand as you can – there is still some sand usually left on the driftwood pieces after you shook some sand off the pieces before putting them into your car at the beach. FROM UNITED STATES, CANADA, ETC, AND NOT FROM SOUTH AFRICA? The next phase is rinsing. 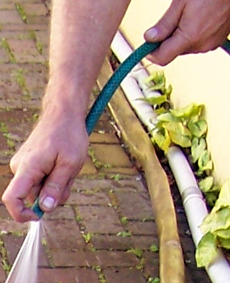 To do this we use a normal garden hose pipe, varying the flow between a gentle stream, and a high pressure blast. We begin with a gentle stream of water, making sure we get the water to flow all over the wood, from all angles, to dislodge and move any sand or other matter that the brushing could not get to. Driftwood with lots of cracks or holes will be hosed at a higher pressure. After hosing we will wash the driftwood. We fill a container with water that will comfortably cover the driftwood, and to that we add a measure of dish washing liquid – about 5ml to 15 litres of water. This helps remove traces of any pollutants that may have been on the beach. 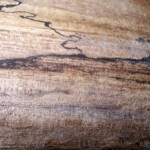 It DOES NOT remove all marks – as very often the marks are there to stay and are what gives a piece of wood character. Washing driftwood also does not really disinfect the pieces all that much. Agitate the pieces around in the soapy water for 2 or 3 minutes. If the driftwood pieces are really small, and the container you’re using to wash your driftwood pieces in is not too big, then just shake the entire container around a bit. After washing, the driftwood is again rinsed with running water, before being soaked in a light bleach solution. We give our pieces of driftwood a light disinfecting with about one part bleach to about nine parts water, for about half an hour. Larger pieces will soak longer. This is to help kill forms of life that may remain on or in the driftwood. Longer soaking periods allow the bleach to soak deeper into the wood, to reach as much of the wood as possible. Longer soaking in the bleach and water solution (or changing it out for a new solution and soaking again, several times) will also help lighten the colour of driftwood pieces, if that’s the effect you want. Or you can use a stronger solution than one part bleach to nine parts water. Soaking the pieces in a chlorine (swimming pool chlorine) and water solution is also a method of disinfecting, and may help you get your pieces even lighter in colour than if you used the bleach and water solution. PRECAUTION: Use gloves when you work with bleach or chlorine, or wash your hands, wrists and lower arms with soap and warm water immediately afterwards, and apply hand lotion. Do not mix warm or hot water with chlorine. Use cold water or room temperature water only. Mixing the chlorine with hot or warm water may produce fumes like tear gas and may upset your breathing. 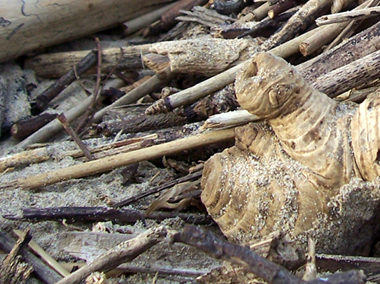 Avoid using chemically bleached or chlorine bleached driftwood pieces with pets or plants. 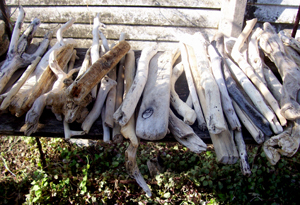 Rather boil your driftwood pieces (with salt added to the water) when disinfecting driftwood pieces to be used with pets or plants. After the disinfecting with bleach and water or chlorine and water the wood is once again rinsed under running water, for a longer period, and more carefully, to remove as much bleach or chlorine from the surface as possible. After the final rinse the wood is left out in the open, where it is exposed to sun and wind, to dry out naturally. 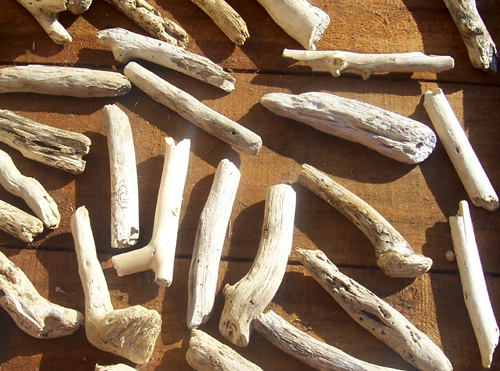 The minimum time for drying small pieces of driftwood (less than 45cm in length) should be about 3 to 5 days. Larger thicker pieces should spend as long as 12 to 15 days out in the sun, in a well ventilated spot. Driftwood can be brought indoors overnight, especially during winter months or during cold or wet weather. If your driftwood pieces get wet in the rain, start your 3 to 5 days (or longer) driftwood drying process from scratch again. Once the pieces of driftwood are completely dry, you can leave them out in the sun for longer if you want them to get lighter or close to white in colour. When your driftwood is completely dry, and as light or pale in colour as you want it, it is ready to use. 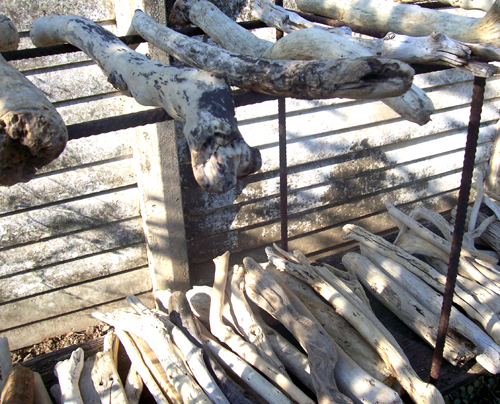 After the cleaning process, we do no further treatment of the driftwood pieces we sell. For driftwood crafts or projects, we or others may like to do some sanding of the pieces, or cutting to desired length, or do some shaping. 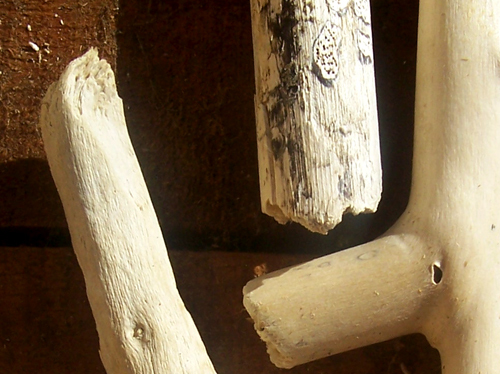 The driftwood character stems from the shapes on, and within the individual pieces. We try to leave each piece of wood in our projects as original as possible, and consequently keep driftwood treatment to the minimum necessary. When you have completed your driftwood craft item or project, a suitable wood preservative is recommended. A suitable wood preservative is one which will accentuate the natural beauty of the wood, while at the same time protecting the wood from environmental damage. There are several methods of treating the wood, to get a good long lasting, and pleasing finish. Driftwood that has gone through the cleaning process we use is very dry, and very porous, which means that it will soak up any finish applied to it, making it appear that nothing has been applied to the surface. For an oil or liquid wax finish it will be almost impossible to notice any treatment until at least 5 coats of the finish have been applied. You can use furniture oil, liquid wax for wood, wood varnish, or a wood stain. 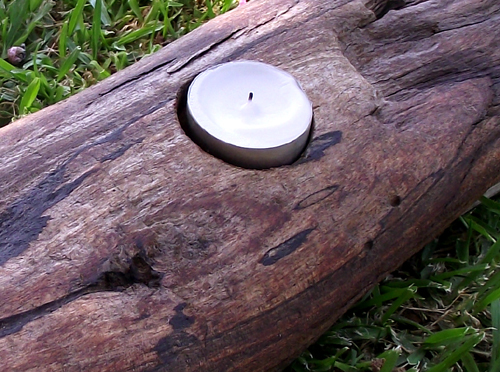 Driftwood can be finished in any method that is commonly used for wood, from oiling to waxing. For oiling, it is our preferred method to use multiple coats of wood oil, added over time. For waxing as a means of finishing driftwood we recommend the Woodoc Liquid wax, applied in the same manner as wood oil. For oils and liquid wax we apply the first 3 or 4 coats with a paint-brush, making sure to get into all the nooks and crannies. Beyond that we will use a cloth to apply over most of the surface, but will still use a brush to get into deeper, difficult to get to areas. Liquid wax finish for wood is available as a matte natural finish. Furniture oil is available as a light or dark finish. Dark oil will not make a dark piece of wood much darker, but will substantially change the appearance of a light piece of driftwood. To achieve a gloss finish, the oil will have to be applied more often, and buffed between applications. A matte finish will not require as many applications, nor will it require buffing. To varnish your driftwood, give it several coats of sanding sealer prior to varnishing. As an alternative to sanding sealer use a mixture of varnish and thinners, also applying several coats before the varnish coats. When varnishing, depending on the sanding sealer or varnish or thinners mixture, as many as 7 or 8 layers will be needed before varnish can be applied. When varnishing, it is essential to lightly sand the preparation layers before adding a new layer. Knowing how to varnish wood will add depth to the natural beauty, and provide a long lasting finish. There are many different shades available in varnish finishes, including matte and natural finishes. We prefer to keep our own driftwood craft items as natural as possible, and will apply only a few coats of oil or liquid wax to protect the piece. This offers the advantage to anyone buying our driftwood craft items that they can choose how they wish to maintain their driftwood item, as it is still possible to stain and varnish, to use a dark oil, or to carry on with the initial treatment. Your wood treatment process may ensure that you are able to enjoy your driftwood pieces or driftwood items for many years. This entry was posted in Driftwood and tagged bleach, chlorine, driftwood, driftwood craft, driftwood pieces, driftwood treatment, dry driftwood, finish, finishing driftwood, how to treat driftwood, liquid wax, oil, sanding sealer, treat driftwood, varnish, white driftwood, wood on July 27, 2014 by The Driftwood People - Terry and Tony.